Make a batch of the best chewy chocolate chip cookies ever and take a break to enjoy a yummy gooey treat. And they happen to be vegan! They have gotten two thumbs up from vegans and meat / dairy / egg eaters alike. All the ingredients can be easily found in your pantry and in the grocery store. The steps for making these are straight forward: beat, add some more ingredients, beat some more, stir in chocolate chips, bake, and eat! Make them mini or gigantic, chewy or crunchy, (I’m a chewy cookie kind of girl)– either way they go best with a glass of soy or almond milk. Enjoy! PS: I also like to make a batch, bake half, and freeze the remaining dough so fresh cookies can be made at any time in the near future. PPS: They are also amazing with some soy ice cream sandwiched in between– YUM. With a hand mixer, blend together the soy margarine and sugars. Once blended, add the soy milk and vanilla. Mix well; the mixture should be a creamy consistency. Add the dry ingredients to the creamy ingredients, mix with a hand mixer or a wooden spoon. Fold in the chocolate chips. Drop spoonfuls of dough onto a greased or parchment paper lined baking sheet. (I like to use a tablespoon to scoop up the dough and make them consistent in size.) Bake at 350F for about 8-10 minutes or until edges are brown. 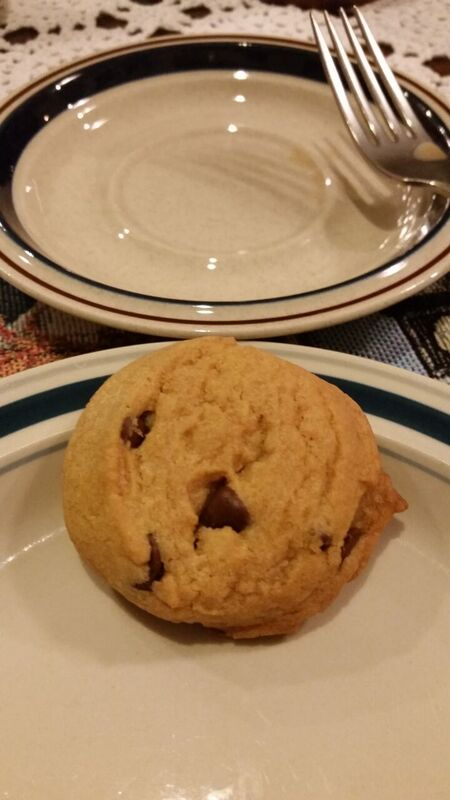 If you like chewy cookies, take them out of the oven right as the edges turn light brown. Click here for a printer-friendly PDF version of the recipe only (no images). I originally found this recipe on Compassion Over Killing‘s website a few years ago. It looks like the link isn’t available anymore but head on over to their newly revamped site for more info on choosing compassion when it comes to your food. :) Totally agree! Thanks for stopping by Abby! Can I use regular Earth Balance from a tub, or does it have to be sticks?? Hi Jane, I am sorry to hear that the recipe did not turn out for you. It sounds like the batter didn’t come out right which caused it to be harder / look like scones–maybe there was an issue with the proportions or did you use a different type of flour other than all purpose? (I just realized the recipe does not specify so I just updated it.) I hope if you find what the issue is you will give it another try in the future! Just made these thus afternoon – gorgeous! Finally cookies that actually flattened! these really are the best ever! Thank you so much for posting this recipe. These cookies are the best cookies I’ve ever made or tasted for that matter. My family loves when I make them and I love that they do not contain any crap in the ingredients. I would definitely make these every day if vegan butter wasn’t so expensive, lol. Is there any substitution for the margarine? Hi Theresa! I am so glad you family loves them! :) I actually just came across a post on good ol’ Pinterest about substitutions- they say for 1 cup of butter use 1 cup of mashed avocado or 1 cup of mashed bananas. (Here is the pin: http://www.pinterest.com/pin/134052526382324894/) I haven’t tried it yet, but if I do I will let you know how it goes and please keep me posted if you do! These were awesome! Totally couldn’t even tell that they were vegan and all of my friends loved them! Sorry it doesn’t sound like they turned out. Mine have been cakey before, not sure if the measurements were a little off or maybe baking powder was used instead of baking soda (I have definitely done that before and the results were not good!). As far as baking, I have used 3 different types of ovens to bake them. In an electric oven, anything over 8 minutes they would start to burn, in a gas oven 9-10 minutes worked best for me, in a table top convection oven, I would have them in for 7-8 minutes. All ovens are different, but almost 20 minutes seems quite long, I wonder if there was an issue somewhere with the batter that also caused this problem. I made these today and they turned out very well. I added 1 – 2 extra tablespoons of almond milk. I would suggest (if baking in a gas oven) to bake for exactly 12 minutes 30 seconds for perfect cookies. I used a tablespoon to scoop and made 40 cookies. This was a strange item to note: I used 2 different types of baking pans and 1 of them the cookies turned out cakier than the other. Next time I am going to add 2 1 1/2 tablespoons of finely chopped rosemary. Thank you very much for this recipe. Does anyone know how many cookies this makes approximately? Thanks in advance! Hi Nadia! Sorry I do not have that listed the yield. I believe the last time I made them I was able to make around 30 cookies and I used a tablespoon to scoop out the dough (a heaping tablespoon to be exact!). Next time I make I will list the yield and also email them to you! For vanilla, will a teaspoon of vanilla extract work? or does it have to be straight up vanilla/vanilla powder? Yes, vanilla extract will work! Will the recipe still turn out if i use coconut oil instead of soy margarine? Hi Alexandra, I have never tried it with coconut oil! I would recommend making a smaller portion of the recipe (half or a quarter) to see if they turn out OK. I will try to use coconut oil sometime soon and will let you know how it goes. , and wheat allergy. So I have white rice flour, xanthan gum, soy flour, and tapioca flour. Hi Tanisha, I have not used those flours before with this recipe but I am going to do some research and try some and get back to you! This is the first time making cookies from scratch EVER let alone Vegan! lol. So I actually made it with rice flour and I won’t recommend it. AFTER making the dough and realizing that the cookies weren’t flattening I looked at the rice flour and they are suppose to give a light and delicate spongeness to it which I think is why it didn’t flatten. They are delicious but a bit light and not chewy. So maybe get a gluten free all purpose flour? Is it possible to use almond milk instead of soy milk? Can you use almond milk instead of soy milk? I just made these yesterday! I did as you said and froze half of the batch as my boyfriend was complaining that he always eats too much when I bake! And I’m glad I froze half of it because he loves them ALOT and so do I! I recently started avoiding lactose all together and also consuming a lot of vegan recipes, and this is seriously beating my traditional cookie recipe! I wish I could make them more crispy though, I love it when it’s chewy in the center and they definitely are, but is there a way I can make them a bit crispier on the edges? Maybe adding vegetable shortening? Or baking a bit longer? Thank you for the amazing recipe! Definitely a keeper! Hi Giulianna! I am happy to hear you and your boyfriend are enjoying this cookie recipe! My boyfriend likes them too! :) I have baked them for longer until the edges are very golden brown and the cookies have come out crisp for me that way. Try leaving a batch in the oven for a little longer and / or flattening out the ball of dough before you bake it a bit- I think this should make it crispier for you! Let me know how it goes! This is my go-to cookie recipe! I’ve been making them for over a year now, and they always come out perfectly! Thanks! Baking these bad boys right now. I subbed the soy margarine for coconut oil. And I did add half a tsp of baking powder because I like them a bit fluffy. They’re delish. My only problem was when I mixed my ingredients together the dough wasn’t coming together. I found I needed to add more milk then just the 1/4 to get it into a cookie dough form. I was tempted to just leave it as small balls of cookie dough and dip them into melted chocolate but I’ve been craving cookies. NEXT time I’ll melt the coconut oil now a bit then add it in. Thanks for the wonderful VEGAN chocolate chips. lots of happy tummys. Hi, i’m gluten-free and i’m trying to find a good chocolate chip cookie recipe, has anyone that you know of tried substituting the flour for a gluten free all purpose flour? if so please let me know :) thanks in advance! I tried it with gluten free flour. They turned out okay, although they were pretty cakey. They tasted better the second day. Hi Kasi! Thanks for letting me know how the recipe turned out with gluten free flour! I am hoping to try to create a recipe that is gluten free very soon. I am so absolutely thrilled with how these cookies turned out! I can never get chocolate chip cookies to turn out just right (yet I keep trying for some reason…) but I just took a shot with these and holy cow I am so happy! I immediately took a pic and sent it out to my mom and sisters so they could praise my awesome new found cookie skills :) Thank you so much for this recipe! I am glad you kept trying and that you enjoyed this recipe! I am sure your mom and sister wish they could have taken a bite ;) You are so welcome and happy baking! These look amazing. Can I sub sugar for the brown sugar? Hi Katrina! I have not tried this recipe using only brown sugar. I think it may change the texture a bit– let me know if you try it out! Ty….they taste great. Best recipe so far! This is almost the identical recipe I use from the book Bakin’ Without Eggs and these are by far some of the best cookies I have ever made. Since I’m allergic to eggs and I’m always looking for recipes that are baked and tasty, I couldn’t help but check this recipe out. Very very good cookies. Gone in 1 day. I’m so excited to hear this was the recipe you used to try your hand at vegan baking! I am so happy you enjoyed the cookies! Happy baking, Betsy! i followed the recipe exact, except for using 1/2c vegetable oil+1/2c melted (and cooled) coconut oil in substitution for margerine. flawless , thanx! can i use coconut palm sugar? also, can i just use 1 cup of sugar instead of 1/2 and 1/2? if not, is the 1/2 sugar, white sugar? Hi Tiffany, I have not used coconut palm sugar before so I am not sure how it will turn out. The mixture of white / brown sugar does make a difference in the recipe so I would stick to that and NOT substitute for all white sugar. I hope that helps! Wow, these are amazing! I also used coconut oil and added dried cranberries…so delicious! Thanks! Hi Vanessa, Another reader just posted a comment saying to triple the amount of baking soda called with baking powder. She used 3 tsp of baking powder and the cookies turned out perfectly for her! I hope that helps! These were awesome! I did not have baking soda and was too lazy to go to the store so I decided to use my substitution trick. All you need to do is triple the amount of baking soda called for in the recipe with baking powder; so here i used 3 tsp baking powder rather than the 1 tsp baking soda and they turned out perfectly! Thanks for the tasty, easy recipe. Exactly what my partner and I were looking for for a New Years Day treat while still in our pjs! Made these cookies for our family tonight and they we’re super yummy! The were crunchy on the outside and chewy on the inside. There was a nice salty flavor. The only difference was that the cookie wasn’t as flat as the picture. Following link is a picture of the cookie. Non-vegan approved! “tastes just as good as any chocolate chip cookie with dairy.” They were definitely the best chewy chocolate chip cookies ever!!!! Delicious – with or without chocolate chips! Can I use coconut oil instead of canoleo soft margarine?? Is it alright if I substitute the soy margarine for earth balance original butter? OMG! These were the best cookies ever. Better than my favorite cookies from…can’t say. Thanks I will make them again. Delish! Just made these cookies, and they are delicious! Definitely the best vegan choco chip cookies I have made. Thank you!! Hi Eleanor! I have not substituted margarine for oil before–although one time I accidentally melted the margarine too much and it made the dough super liquid-y! I think for this recipe with this method of creaming the butter and sugar together I would recommend using the margarine. I just made these with oil because I did not have margarine on hand (mostly because I do not like using it). The batter looked and tasted a bit strange so I decided to add some oats and cinnamon and make them into chocolate chip oatmeal cookies. They came out really great: chewy and flavorful albeit not chocolate chip cookies! Not sure how it would have come out without the oats and cinnamon but I am assuming it wouldn’t have been bad. Hi, I don’t really like the taste of soy, can you taste it much? If so, are there any alternatives to soy milk that won’t mess up the recipe? Hi Abbye, I personally don’t taste any soy in it but if you’d like you can use almond milk which I’ve tried before! I hope that helps! why can you not use baking powder?? what will be the side effect? Does anyone know if you have to flatten the cookie or will it spread on its own? Thanks! Hi Kendra! After I shape the cookie dough into small balls, I do flatten it about halfway so it is more like a thick round coin shape. They will spread a bit on their own as well. You can also test out a few cookies first before baking the whole batch if you’d like! I hope you enjoy the cookies! Hi! I hope that all is well. I would like to ask you, if anyone know, about whether or not almond or rice milk will work the same as soy milk and whether or not we can use olive oil / coconut oil instead of vegan margarine? Thank you for stopping by and for your questions! I have used almond milk (and do so often) in baking so I would recommend using almond milk in this recipe. I haven’t baked with rice milk lately but have in the past and for me, I did not taste a difference (different brands may differ in flavor though). I would not recommend using olive oil because the olive taste may affect the flavor of the cookie. How many bananas did you use? and were they really ripe? Hi Emily! I’m sorry your cookies didn’t turn out! That’s odd it would taste like baking soda as the recipe calls for 1 teaspoon only. I hope you will give it another try again in the future–my suggestion would be to double check all dry ingredient amounts as it sounds like the ratio may have been off. Good luck! Can I use canola oil instead of butter/margarine? If I can how much oil would I need? I have a grandson who can not have any dairy products. Thank you. This is my go to chocolate chip cookie recipe! None compares!! I’ve used them as the base for cookie ice cream sandwiches and it’s so yummy. Now I omit the last 1/4 cup of flour because they can come out too floury/ dry sometimes. Hi Olivia, thanks for a great recipe! the taste turned out great, though I am a bit dissapointed the cookies didn’t spread at all in the oven, they remained exactly the same shape and size (therefore I flattened the dough balls with my hands on the second batch, which turned out better). Why do you think that is? how do you make them get flattened in the oven? I did exactly as the recipe say except for using coconut oil instead of margarine . maybe it’s because my house is relatively cold? Hello! I’m glad you tried out the recipe! I have only used vegan butter in the recipe and have not tried any substitutes so I feel that the coconut oil may have been the main factor in the cookies not flattening. Normally I put a scoop of dough on the parchment paper and slightly pat down with a few fingers so it looks like a thick disk shape and it flattens out while in the oven. If you are able to try the recipe again with vegan butter (I have used Earth Balance and Canoleo) I would highly recommend that! Also, I’m not sure what form the coconut oil was in but when I use the vegan margarine I heat it up in the microwave so that it is not liquid but a very soft texture. I hope this helps! this is the best cookie recipe ever!!! soft, chewy and super tasty. better than anything you can buy in store. Hi, I want to make these but I can’t have white sugar. Would it make a big difference if I used all brown? I was really excited to make these and I gotta say I’m pretty upset. I wish I read the comments first because mine turned out so cakey and I’m really disappointed. I keep looking at the recipe but I did everything right, I didn’t use baking powder, I did all the right measurements, I’m just baffled. Great for everyone who got a good cookie but mine are inedible. Hi Marisa, I’m sorry to hear the recipe didn’t work out for you. I’ve made this recipe many times and they have always turned out. The only suggestion I can think of is to check the expiration date of the baking powder–it may help to use a new can if the one you have is older (this has happened to me before). thank you for recipe! :D i’ll try.